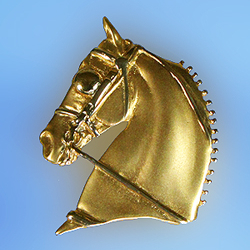 Ideal for an Omega necklace, a nice chain, or enjoy as a lapel pin and pendant combo. This design offers an exposed bail set at the top of the head. 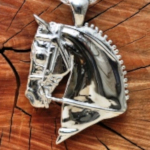 This Hackney fine harness pendant is a really unique design. Offering the blinds, ribbon, and the full harness make this one stand out above the rest. Pictured here is the Hackney in a satin and rhodium plate finish.